Dallas sits like a jewel in the center of Texas, but will prove to be a jewel out in the open and without protection during the coming cataclysms. Freed from concern about earthquake damage, being away from fault lines, and concerned only with replacing a few windows after any hurricane that might travel inland, Dallas has had few worries. 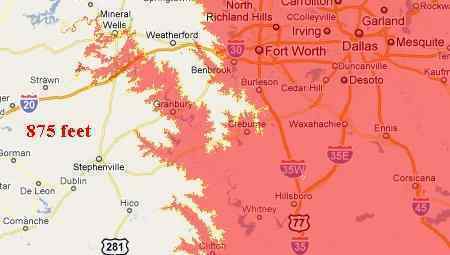 During the coming cataclysms, Dallas will find itself presented with wind and water changes that it cannot resist, and its residents will be without protection. Water does damage that those viewing film of floods cannot imagine, unless one were viewing the effects of the flood waters as they encroach. Water melts the substrata, as well as presses against foundations not built to resist such pressures. Thus, unless constructed on solid rock and with thick walls, most structures will lean in the winds and be pushed over by the rising water. Where a high rise does manage to stand above the water, it will become filled with desperate survivors, who increase in number as they manage to paddle to these islands. The flood waters will take days, and in most cases weeks, to recede. And what, during those weeks, will these survivors eat and drink? Few will survive, and those that do will live with tortured memories. 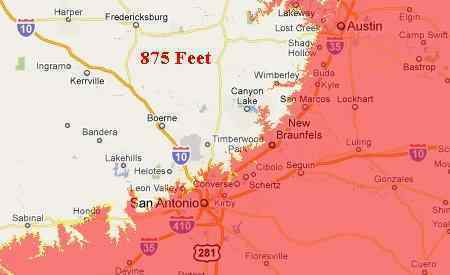 Dallas, Forth Worth, Austin and San Antonio are all along the edge of the Balcones Escarpment edge where they will not have the height to avoid the pole shift sloshing, which for Texas will be as high as 875 feet. Scoured clean by the tide, with floatsam dragged out to sea, there will be few survivors. Residents of these cities, hoping to survive the pole shift, should move inland sufficiently so as to avoid the pole shift tides and not expect to be able to return to their devastated homes afterwards.